Paperless: it’s not just a 1990’s ploy to get you to use that weird electronic mail. Through technology improvements and changing some workflows, we’ve not only improved our efficiency, but we’ve been able to cut our paper waste associated with processing background checks by almost 100%, including expanding paperless communication in finance and accounts receivable! We’re looking forward to more changes in 2016, including one that’s in progress to virtually eliminate paper usage in our sales department... and they’re already pretty good! Getting rid of the bottles. One of the perks of working at Choice Screening is we never go hungry! We unanimously decided to stop buying bottled water and moved to jugs – it might not be as convenient, but we knew it was important! Not only this, now almost every employee brings in their own bottle to refill instead of using a plastic cup. R-E-C-Y-C-L-E that’s what trash means to me! 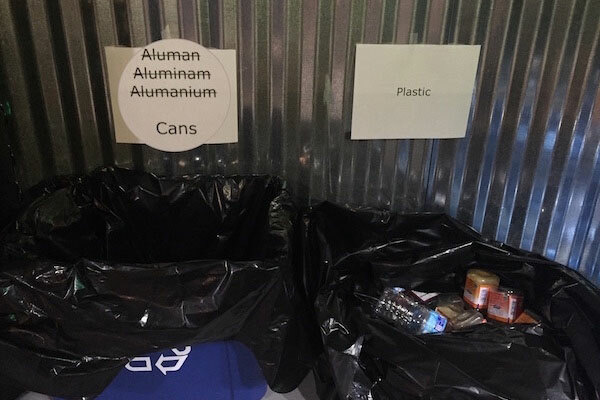 A few months ago, we set up bins for recyclables. It was quickly overflowing so our IT Director, Mark, took charge. And, in true fashion, he helped with the signage so we properly sort our cans and plastics! (And have a good chuckle.) Recognizing that we need to securely shred papers, but wanting to protect the environment, our shredder recycles our paper waste and has since we started using them years back! LED Lighting & New Blinds, Oh My! We’re lucky enough to have a long row of windows overlooking beautiful eastwardly views and a taxiing strip for a personal aircraft hanger – bathing our sales and research teams with lots of natural light! We replaced our old blinds with light reflective blinds that filter light, helping defer heat from the sun. For the rest of us, we’ve swapped energy sucking bulbs with high-efficiency LEDs to significantly reduce our electrical demand and reduce our carbon output. The lighting is better on our eyes and the environment! At Choice, we know that we’re all responsible for what little, or lot, we can do to reduce our carbon footprint. By making some minor changes and investments, we’ve noticed a major difference! And, it’s really fun seeing our team come up with new strategies to improve our efficiency while identifying the environmental impact of such efforts! Want to learn more about Choice Screening?